Originally pet fences were designed for use with dogs. The technology available did not lend itself well to use with cats as the computer collar receivers were too bulky. In the last 10 years technology has advanced and CatFence are proud to be able to offer the smallest and lightest computer collars worldwide. At CatFence we have pioneered a unique, simple and safe training protocol for cats. Our collars have been developed with more flexible and gentle training levels. With recognition from vets and a leading cat charity the number of cats using our systems is growing rapidly year after year. An invisible cat fence will give your cat freedom whilst keeping him or her happy and safe in their own garden. You can also use a hidden cat fence to designate areas that are “off-limits” such as flowerbeds, a gated driveway, children’s play areas or swimming pools. As well as providing safety and security for your pets, a pet fence that is hidden underground has benefits for you. You will have no more worries about your pet running off or escaping onto the road. The pet fence is not intrusive as it not a solid structure but it will give protection against open areas and driveways. With a cat fence system, you get all the benefits of letting your pets roam free without the associated stress. Your garden also benefits – unlike costly and ugly cat fence enclosures our fences are invisible. 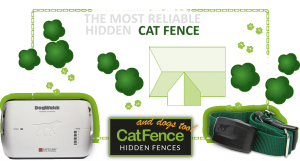 Catfence is part of Dogfence Limited, the UK’s distributor of Dogwatch Hidden Fences. Based in Marlow, Buckinghamshire, we supply and install concealed pet fences throughout the UK. 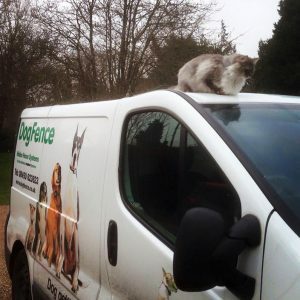 Just resting on the van whilst they install my cat fence! We are unique in the UK in using FM frequencies. Other invisible pet fences use AM frequencies, which are slow to respond and prone to interference. Safelink, Dogwatch’s patented FM digital technology, provides maximum protection against false activation of the computer collar. With an AM system stray signals can accidentally activate the pets collar. With our CatFence system this hazard is removed. Safelink is 15 times faster than any AM pet fence which means no pet can outrun the FM signal. Our receiver collars are smaller, lighter, and kinder to your pet. The R7m collar is the smallest on the market, and weighs just 30g. 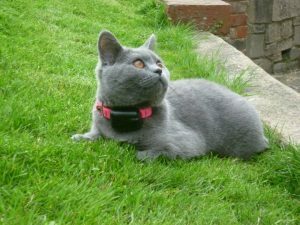 Felicity the British Blue enjoying an early spring day.